Stephen Craig Paddock is the Las Vegas shooter who is responsible for the largest mass shooting in modern times in the USA. He amassed an arsenal of weapons and fired off thousands of rounds at an open-air country music festival from his hotel room on the 32 floor killing 58 people and causing injuries to 500 others. Where to start on this chart? It is a very complicated chart with many layers. He had a Cancer ascendant, which makes the ruler of the chart the Moon. Sensitive and nurturing are common traits of Cancer rising, one who will take care of you and family is part of their equation. These people are nostalgic. His Moon is in the eighth house of death, transformation, and other people’s money in the cold, detached sign of Aquarius. It is opposite Pluto in the second house of money and values. This partly explains how well off he was with Pluto in the house of money and the Moon in other people’s money and the ruler of his chart. The other side of it is that Pluto opposite the ruler of the chart can give people a high level of intensity. They may have control issues whether they want to manipulate people to control them or find themselves controlled by others. However, it also sheds light on his view of his mother. The Moon in the eighth in cool detached Aquarius suggests that she was not that close or nurturing with him, or that is what he perceived. The Pluto opposition adds an element of control and power struggle with the mother or he formed a sense of an obsession with respect to the mother. It is very likely he almost died at birth as this a signature of the Pluto-Moon opposition. 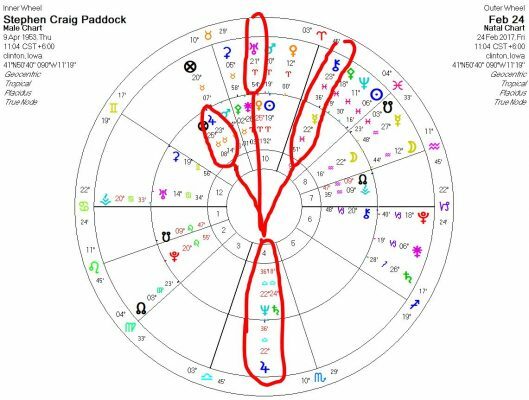 The first sign that he had issues with his father is that his chart has Saturn retrograde opposite the Sun. This according to Noel Tyl, the Saturn retrograde at birth is a sign that the father is absent, a workaholic, an alcohol, or possibly died early. In this case, Paddock’s father was a bank robber who was on the FBI’s most wanted list as he was incarcerated early in Paddock’s life and on the run. Because Saturn is conjunct Neptune, there is a sense of secrecy around his father and possibly a sort of idealising over his father. There may have been a hidden nature to his father’s identity early on. The Neptune-Saturn connection is interesting as Saturn is our structure and limits and Neptune dissolves and allows us to fantasise, so from that he had loose structure and framework but rigid fantasies. These two planets are together in strict contradiction to each other. Neptune and Saturn are in Libra in the fourth house. The fourth house is the house of family, home/land and represents your roots. This signifies he had a difficult or a strict home life. The Neptune in the fourth made it difficult for him relate to his family, as he would have felt confused as to the relationships and the order in the family dynamic. This issues around his father are amplified by a yod pattern. In Western astrology, we have a configuration called a yod, which in the Hebrew alphabet is the 10th letter and the smallest. It is the first letter of the word which is the unspeakable name of their god Jehovah (yod-he-vau-he or JHVH). In Jewish cosmology, JHVH is not pronounceable as there are no vowels but it signifies the divine power. Symbolically the yod is the spark of divine creation. However, in astrology, it represents more of a karmic pattern that is present in a chart as is explained in Hamaker-Zondag’s The Yod Book. The Yod has two planets in a harmonious aspect called a sextile (60°) where the planets energies complement each other. They are both in a difficult aspect called a quincunx (150°) with a third planet in which the planets don’t have any connection to each other but are forced to interact. You have probably have been in an awkward situation where stuck in a room with someone you really do not have anything in common with and forced to make small talk. Imagine a good ol’ boy trucker with a Tibetan Buddhist monk trying to talk about their pastimes and while watching interpretive dance of which they need to write (together) a one-page story about their experience. That is the energy of a quincunx. The harmonious part, or the sextile, is Jupiter (expansive, learning, and philosophy) in earthy and grounded Taurus and Mercury (commerce, communication, and thinking) in secretive, spiritual/addictive Pisces. These two planets work well together helping him learn and grow philosophically and could explain why he was very good in business. In between them, so they are semi-sextiling, he has Venus the planet of values, women, and relationships in the individualistic, aggressive sign of Aries. He had some good business dealings and was probably straight up in his business dealings. However, let us bring in the point of the yod. Neptune and Saturn. We already mention what they entailed but they now going to get further complicated. Since he has the opposition to Venus, this makes this Yod more intense, so let us deconstruct that first. Saturn/Neptune opposite Venus reflects that he might have issues around relationships or with women. It also suggests that he had very rigid value systems. The Saturn brings about difficulties and Neptune about illusions and delusions around those relationships. We do not know how he behaved with business partners and those relationships may have been okay but he probably had difficulties with women. Now, let us throw in the Yod to Jupiter. His philosophy and growth were coming from an absent father who moved the family around because he was a bank robber who was on the run. Most people want to look up to their father or to emulate their father, so how did Paddock handle this situation when he was younger? Now, we add the Yod to Mercury in Pisces to the equation and it brings outset of tensions around his father and the man he was. He may have had difficulty communicating and understanding the limits around him, which could have worked to his advantage in his business dealings. Mercury is now the point of this yod. The Neptune/Saturn conjunction is now in a sextile with Pluto. Pluto is the planet of power, control, death and transformation. Pluto and Neptune gave his strong intuition as Pluto is also opposite the Moon. The Saturn and Pluto sextile helps him deal with transformations in his life. It gives him a way to deal with control issues. However, the yods to Mercury complicate matters suggesting there destructive, fearful and fantastical ideas pumping through his mind. Mercury cannot comprehend or get a proper grasp of the energies that Pluto and Neptune/Saturn are providing him. It could result in a belief that money will give him a sense of security and control. People learn to deal with the energy in their chart but when something triggers these points then people will act out the energy. Transits are the current position of the planets in the sky relative to the birth chart. The Sun and Ascendant are your intrinsic personality points. The Sun is your true identity and the Ascendant point is your outward face or how you react naturally to events in life. When the rebellious and chaotic planet Uranus comes along and contacts these points you may look at changing your perspective and approach to life’s matters. Uranus square the Ascendant you may change your look or something like that or how you face the world. 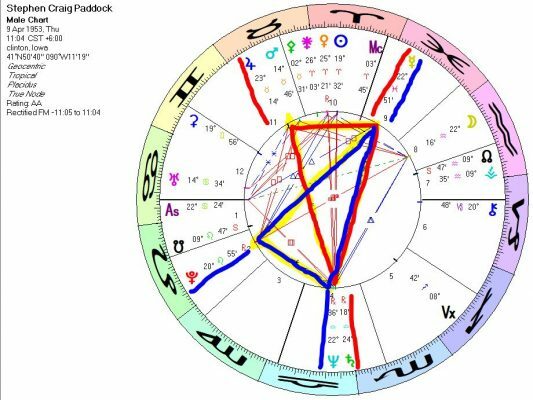 Paddock had Uranus conjunct his Sun first from June 2015 to late February 2016 and then squaring his Ascendant from May 2016 and March 2017. This is a long time for that kind of intense and electric energy, which Uranus brings. It suggests that there were some major changes to his persona. Some urge of rebellion, the need to break free from any perceived chains that were holding him especially since Uranus rules his eighth house of transformation and the “psychological dumpster”. At the same time, Uranus was activating the yod by opposing Neptune and Saturn bringing that energy dynamic and possibly father issues out. 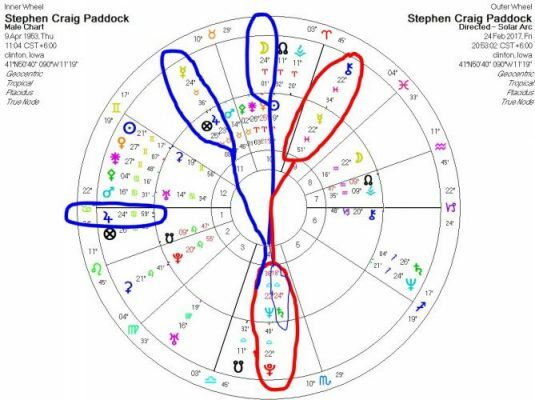 Transiting Uranus was opposite the natal Neptune /Saturn (both part of yod #1), as they are conjoined, at the same time Jupiter was exactly on Neptune on February 24, 2017 and squared his Ascendant three days later. Jupiter brings abundance and Uranus is a planet associated with rebellion and brings sudden and unexpected changes. This can be translated into a radical change of philosophy. Chiron, the asteroid of the wounded healer and the maverick, was directly on his Mercury (exact on Feb 11, 2017) that is a part of the yod #1 and the apex of yod #2. I am figuring it was at this time he started planning an attack. By looking at the Solar Arc Progressions on that day, it is quite telling suggesting that four planets were activating the same yod on that day. Pluto, the planet of death, hidden secrets, and transformation was at the apex of yod #1 on the Neptune (exact was Jan 28). Neptune rules his ninth house of philosophy. Solar Arc Chiron was on his Mercury that is part of yod #1 bringing up old issues around his father/family and the apex of yod #2 probably triggering anger and delusional thoughts. Solar Arc Chiron, old wounds, was conjunct his Mercury (mind) and was quincunx his Saturn that rules his seventh house of relationships and the eighth house of death/transformation. At the same time, Solar Arc Moon was opposite Saturn in so memories were being stirred up and since the Moon rules his outward persona, it was triggering all sorts of internal issues such as needing control. Transiting Jupiter was also squaring Uranus the ruler of the 8th house of deep psychological issues. Jupiter also rules his sixth house of illness so it could be that with natal Jupiter as part of the yod one yod along with Mercury (mind) and the Moon (memory), he could have suffered some type of breakdown during this period. This combined with the previous events could be the trigger that caused him to start putting his terrible plan in motion. There were obviously others with the same birthday as Paddock who would have been born near his time but they did not do what he did. They may not have had the same upbringing. Their father may have been a workaholic or absent but not on the FBI’s most wanted. The person’s environment is a major factor on how they will act out the energy in the birth chart. The important thing is to be conscious and to understand what you are going through or you run the risk of acting out your birth chart unconsciously. A Mercury square Mars aspect can cause you to say mean things or think quickly. If that aspect is triggered by a difficult planet like Uranus or Pluto, you have both options available so what you say will be a transformative plan or the Hiroshima of bombshells.